FeliX formula for irrigated area σ, expressed as a fraction of agricultural area. σMIN and σMAX represent lower and upper (a priori) limits on irrigated area, and are defined to be 0 and 1, respectively. GDPpc is global productivity per capita (variable), and GDP† is a reference value calibrated to 120,000 (US$2005 per capita). 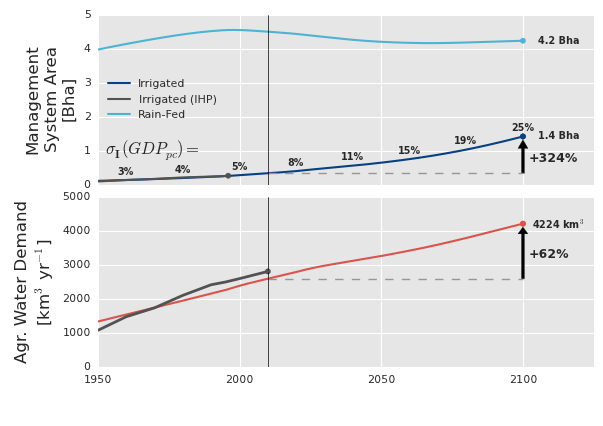 The plot below traces the expansion of irrigation systems through 2100, explicitly displaying the percentage of agricultural land under irrigation (σ). This high-efficiency water management strategy is predicted to expand over 300% by the end of the century. Also shown is rain-fed area, which oscillates within a smaller range over the same period. FeliX formula for areal water demand (ω) of irrigated (I) and rain-fed (R) land. Demand is scaled between ω MIN (I,R) = (0.005, 0.005) and ωMAX (I,R) = (0.05, 0.1), representing minimum and maximum water demand, respectively. GDP†(I,R) are reference values calibrated to (4,000, 8,000) (US$2005 per capita). otal demand through 2100 is in the lower half of the plot above. Over this period, intensification and expansion lead to a 60% increase in total agricultural water demand.